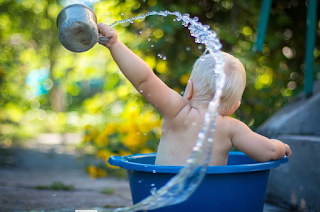 How To Bathing Baby For New Moms - Bathing the baby is a wonderful thing. But a new mom with her first child must do so carefully. Because if not careful, then it will be dangerous for the baby. For you new mom, you can follow how to bathe a good and true baby following. Before bathing the baby, we should prepare all the things already near the baby's bath and also the place of the baby change. Do not forget anything. We can not leave the baby to pick up the equipment we forget. Because it is very dangerous if we leave the baby alone. Moms should check the temperature of the bath for the baby, making sure that the bath temperature for the baby has been adjusted to the temperature that has been adjusted. The easiest way to check the water temperature is to enter our elbows into the water. This way you can use to check whether the baby's bath water is too hot or too cold. If fit then the baby is ready to be in the bath. This is important because bathing a baby with water can only provide a sense of comfort and also keep the water temperature equal to the baby's body temperature. The ideal temperature for bathing the baby is about 36-37 degrees celsius. Bathing the baby is certainly very exciting and sure the mothers will use the best baby soap on the market. But we must ensure the level of foam contained in the baby bath soap that we use. Be sure to check the baby's soap foam levels, Baby soap that uses high levels of the suspension can make a lot of foam but not good for use for babies who have very sensitive skin. Choose a safe soap for the baby and make sure the soap contains vitamin E that good for the baby's skin. Should not use anti-bacterial soap for the baby, use a bath soap that is specific to the baby. Avoid bathing the baby shortly after she eats, especially when newborns, usually newborns will often vomit. If this happens in the bath then you will be bathing the baby again. Open the baby's shirt carefully and wrap the baby in a towel after the baby has bathed, wipe the baby's eyes with a cotton swab with cold water, wipe the area around the baby's face and mouth. Clean the baby's eyes from the inside out with the wet cotton we have prepared. Wash the head, face, chest, neck, hands, back and legs, note the area of skin folds in the baby, the outer part of the baby's nose and also clean the outer part of the ear that can be seen by using wet cotton. To clean the baby's head, we can shampoo the baby in the bath when we bathe the baby. Use a shampoo that is special for the baby and make sure to hold the baby's head when you are infanting the baby. For a baby who is 1-3 months old you should hold the baby's head as you infant the baby. When you have finished bathing, you should immediately bring the baby to a special place to dress. Tap gently on the wet part and dry also the water in the baby's head with a soft, dry towel.